What is Crunchy? | Back Home Again: What is Crunchy? A friend and I were discussing "crunchy" things we do this past weekend and it got me thinking (which is fitting since I'm guest posting at Wannabe Green today - check it out!). What qualifies as "crunchy"? According to http://www.urbandictionary.com, a person who is crunchy has "adjusted or altered their lifestyle for environmental reasons." When I think of a crunchy mom, I think of someone who breastfeeds, cloth diapers, makes their own baby food, baby wears and co-sleeps. Not to mention doesn't vaccinate, grows their own food, uses all-natural remedies, makes their own cleaning products, recycles, joins a csa and/or meat share and is gluten-free, vegan or some other non-mainstream diet. 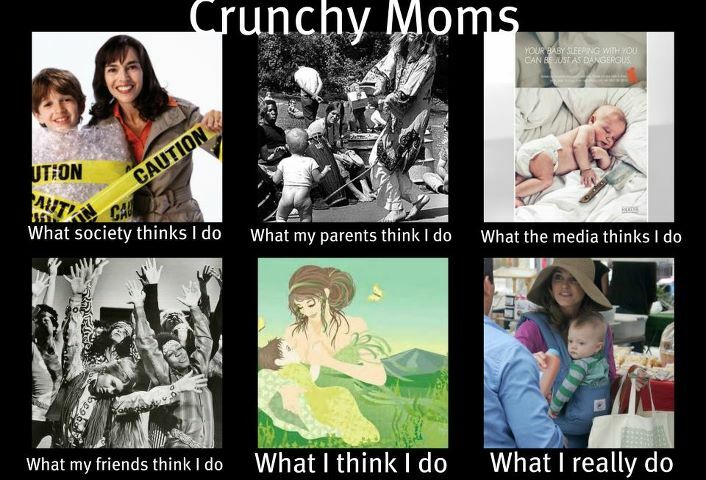 I don't really consider myself crunchy at all and my ICAN buddies call me the mainstream mom in the group. But after our conversation, I realized that out of that list above, I breastfeed, baby wear, co-sleep, recycle, grow my own herbs and vegetables, joined a csa for the first time this year (but am a frequent visitor to the local farmer's market), use natural cleaning products whenever possible and am attempting to make my own baby food this time around and have been dabbling in natural food dyes. Maybe I am pretty crunchy afterall. What about you, are you crunchy? What are some crunchy things you do? oh yes. vegetarian, diy laundry detergent, baking soda and vinegar always on hand, trying to grow tomatoes on my apartment balcony. I've accepted my crunchiness. I breastfed, tried for natural birth, cloth diapered for a bit, baby wore...hmm, all these things are in the past since my kids are older, lol! I did vaccinate and circumcise which clearly removes my crunchy card! Hmm, I suspect that when I have kids someday I'll be more of a crunchy mom... lol Not entirely, but I'd like to adopt a lot of those traits. haha love this. i'm semi-crunchy - i'm a vegetarian, try to use reuseable grocery bags, recycle, and grow my herbs. so that's a decent amount of crunchiness, right? Coming from GFC collective blog hop.